Don't wait if you think an animal is in trouble. Prompt action does make the difference between life and death. Please don't just watch a hog in trouble, it is better to call someone and find out that it is OK, than wait and find out it is too late. The earlier a wild animal in trouble is rescued the better the chance of a happy ending. Covering: North Worcestershire, Bromsgrove, Droitwich, Redditch, Stourport on Severn, Kidderminster. South Birmingham; Rednal, Longbridge, Northfield, Stourbridge. And surrounding areas. We are now in our 7th year of running which has seen many hedgehogs come under our care, many changes and improvements to our facilities and knowledge and we would like to thank everyone for their support. 2015 saw the opening of the newly built hospital extension and facilities. 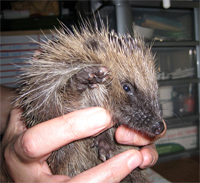 Changes that you can easily make to help hedgehogs. Providing Access, Habitat, Food and Safety in your garden. We are working with councils, contractors, manufacturers and Housing Trusts to safeguard hedgehogs from gardening injuries. Hedgehogs need your garden to survive and there are many simple ways to help them and other wildlife flourish in our towns and cities. A log pile, a leaf pile, long grass, wild areas, a wildlife friendly pond. Just some of the ways to help. 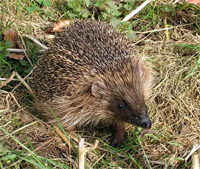 Hedgehogs need to travel through a number of gardens in a night. New housing developments are increasingly causing issues with impenetrable fences and gravel boards, please join us in campaigning for a simple solution. You can also make the same change in your garden if you have solid fencing. 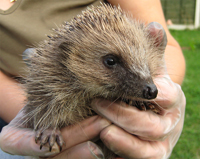 Thank you for visiting the Willows Hedgehog Rescue site. We are a self funded hedgehog rescue service dedicated to rescue and rehabilitation of distressed, orphaned and injured Hedgehogs as well as providing awareness and education. 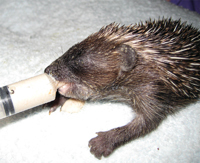 We respond to incidents of injured & ill hedgehogs & orphaned hoglets providing examination, treatment and rehabilitation ensuring that the hedgehogs get the medical attention they need either via our vets in more serious cases or in the majority of cases via ourselves. We keep them fed and safe in our rescue area and finally in our outdoor pre-release area until they are ready for release back into the wild. Sadly some hedgehogs do sustain injuries that despite ours and our vets best efforts are beyond repair or would cause insurmountable disability and in these cases they have to be euthanized but we ensure that this is carried out humanely and only when absolutely necessary. 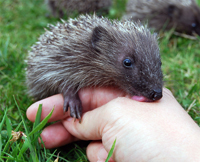 Hedgehogs are in decline in the UK and have suffered due to many changes: land management, urban encroachment on the countryside, increased road traffic, ignorance, very tidy gardening and from the use of pesticides and netting to name only a few. This has resulted in many displaced and injured hogs. 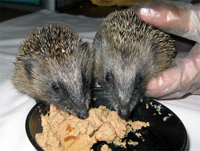 It is our aim to care for these Hedgehogs, to rehabilitate them and return them to the wild where they belong. We also wish to bring these hazards to the attention of everyone to try to make the world a better place for these wonderful, iconic and unique little creatures. PLEASE HELP TO SUPPORT US. 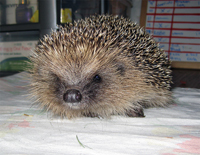 Even just a couple of pounds helps towards the treatment and daily needs of the hedgehogs in our care. The cost of running the rescue unit runs into thousands of pounds every year, all of which we rely on fundraising and donations to cover. rescue and rehabilitation. We do not draw a salary and nothing goes on administration. You can help hedgehogs by leaving some food and clean water out for them. Dry puppy or kitten biscuits are the best in chicken or beef flavours, soft food can be left out as well but will need regularly changing. Place the food bowls under an upturned plastic tub or wooden box with a 4" square hole with the sides smoothed. This lets the hedgehogs get to the food but cats etc can't allowing the hedgehogs to eat in peace & stopping the food being eaten before they can get to it. Oh and don't forget water is very important, a dish of water can be a life saver. Of course to able to enjoy all of this hedgehogs have to able to get into your garden. All it takes is a 5" gap and hedgehogs can get in and out. 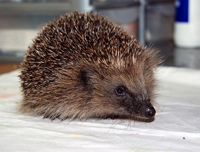 You can also help hedgehogs by providing suitable habitat in your garden for them. For more information about us please visit the About Us page. Character Willow, Copyright Charlie Creek.